We return! Battered, bruised, bloodied. But unbeaten – as yet. UK Games Expo Day 2 (or 2 and a half if we’re factoring in breakdowns) started as we rose from the depths and Ben, Mike and I creaked our way towards the NEC. Our first stop was Original Content London and Sam talked us through their card game: Thronestorm. Since the Expo, Ben and I have played some Thronestorm to try and wrap our heads around it. The game contains forty cards of ten colours in four suits. The deck is split into the four suits, with each being shuffled. Players then draw one of each suit to their inventory. On their turn, players can draw from one of the suits, playing either that card onto the board or one from their inventory. Or they can play multiple cards onto the board to draw cards back from it. The goal is to gather a complete suit of a single colour into your inventory. As Ben and I played, we began to scratch the tactical layer of the game but we were definitely fumbling around in the dark. This is a game that you need to play many times to see what’s going on and explanation doesn’t really do it any service. Whether it’s particularly robust or not is open for debate. The bulk of the tactical thinking in the game seems to revolve around preventing your opponent from getting what they want, while struggling to figure out what you want and how to get it. So the game is primarily about delaying things rather than being active. Additionally Ben won our game when I drew a card on my turn, revealing the card he needed underneath which he simply needed to draw. I’m not sure if that’s a legitimate tactic, but it certainly felt anti-climactic. I’m going to get out this out at the top: Band Manager is rad. The players are competing managers who organise tours by contributing equipment, bands, and promotional material in the form of cards. The current player, the Tour Manager, decides what kind of tour they want to go on. Different tours provide more cards and less fans (and vice versa) depending on their level. So a tour manager who is low on equipment, bands or promos could decide to go on a low level tour so the group can draw more cards in preparation for the next tour. The core conceit of Band Manager is really what ties the mechanics and the aesthetics together though. Tour Managers take bids of contributions of cards from other players to carry out their tour. So players compete with each other to participate in the tour and the subsequent rewards. If one player has too many fans, they can absolutely get cut out of a couple of tours by their fellow managers. The game nails the stereotypical pettiness of small time band politics with players arguing they should be on tours based on what they contribute. And that so-and-so should be ‘fired’ because they’re getting too big or making too many demands for rewards. Add to that the fact that Band Manager also delivers on the ‘Rock-Lite,’ tour feel of band touring. The board is a band t-shirt. The special ability tokens are denim jacket patches. Player markers are pin badges. This game is tied together incredibly well, and well worth looking at. Lueisa of ITB Games sat me down and talked me through ‘Newspeak’. It’s set in a dystopian world monitored by one of the players who takes on the role of the ‘Monitor’. The other players are dissidents who elect a leader from amongst them. In a similar manner to Spyfall, a number of locations are laid out in front of the players and leader selects one in secret. They then select a secret code from seven and passes the cipher to the other dissidents. The codes are not particularly complex, they’re straight forward substitution. So ‘Midnight’ = ‘Liquid’ and ‘Time’ = ‘Indoor’ and so on. The Monitor has access to all the ciphers, but does not know which one is in use. The Dissident Leader must then use the code to communicate to the other Dissidents which location he has selected. The Leader must mix in the coded words into conversation with the other Dissidents in a way that is direct enough for the Dissidents to pick up, but indirect enough for the Monitor to not narrow down which code is in use and identify the location. I’m a big fan of social games, particularly ones that require you to improvise – I picked that up from Table Top RPGs – so this is right up my alley. It needs players to be creative and attentive. And has the flexibility that allows them to use conversation and wordplay as the tools to succeed or fail. As players grow more sophisticated at playing the game, they may use antonyms and synonyms of the coded words to convey meaning. Or use questions to cleverly interpret the Leader’s responses. I got to chat briefly with Dan Ahem of ITB about the project. They had originally launched Newspeak on Kickstarter, but failed to achieve their funding target. After stripping out elements of the game, streamlining it and focusing on the use of wordplay, they’re preparing for a September re-launch. I’ll be looking to put up a review of Newspeak before then. While at the ITB booth, I also spoke to Tom Ana about his Open World Adventure book Alba. Tom described it as a desolate, post-apocalyptic ‘choose your own adventure’ set in Scotland. I asked him if he had ever been to Castlemilk. The Open World aspect is reflected by the fact that the adventure has a map which acts as a hub and players go to locations as dictated by page numbers from the hub. The idea is that you have a sense of exploration in a ‘living world’. I got the sense that the book serves a similar role to that of a GM in an RPG. Tom wants readers to explore this frozen version of Scotland – which he says he sampled from Aberdeen, Glasgow and Edinburgh – and meet the kinds of inhabitants who would inherit and survive in this country. It’s always cool to see games and other media take inspiration from and adapt recognisable aspects of British or Scottish life. 2000 AD and SLA Industries spring immediately to mind. (Check out SLA Industries for a singular and well realised Splatterpunk world that bleeds the West of Scotland). I’m looking forward to giving Alba a read and letting you know how it is. I caught a sideways glance at the design of the banner of ‘Peak Oil’ and had to stop at the 2Tomatoes booth. Jordi Rodriguez kindly chatted me through the core idea. Players take on the role of oil companies desperate to stay in business. They must use the proceeds from the sales of the world’s dwindling oil reserves to buy and adopt renewable technologies. Players place workers to drill oil which they drawn blind from a bag. Draw a black barrell and you can go on to refine and sell it. Draw a red barrel and there has been a disaster during the drill and you have incur penalties arising from the PR nightmare. (note: you only clean up the image of your company, not the oil you’ve dumped into the environment). The proceeds of the sales are then used to purchase start-up companies which specialise in renewable resources, which will allow your company to survive the end of the oil business. Alternatively, players can purchase the services of ‘consultants’ – shadowy people in smart black suits who solve problems – to attack their competitors or trigger a boon. Jordi talked a little about the genesis of the game as well. It’s creator, Heiko Gunter, was inspired by a BP advertisement poster from the 1960’s of a solitary oil platform. I would guess that the cover art for the box is a reference to this inspiration. 2Tomatoes look to make games which are socially conscious and express ideas through their themes and gameplay. For instance, their upcoming game, New Corp Order, explores the pervasive and insidious aspects of corporations using PR/Marketing to promote their brand. Miguel Brudie, the designer of the game, was inspired by the clean, corporate aesthetic of Peak Oil when creating NCO. Players take on the role of companies who must compete for influence with faceless conglomerates by purchasing shares or planting their own people within them. These conglomerates control various marketing firms. The players will use the influence they garner within the conglomerates to shift the advertising strategies of the marketing firms in their favour. Consultants make a return here doing all the seedy, behind the scenes ‘problem solving’ stuff, and act as Action cards. You can request ‘Print and Play’ versions of both Peak Oil and New Corp Order from their website. In fact, it wasn’t until I started writing this piece and checked out their site that I realised that 2Tomatoes are responsible for Pocket Mars, a neat little worker placement game that I’m very fond of. I’m looking forward to seeing them next year when New Corp Order is hopefully out and they have something else in the pipeline. After exploring the dystopian themes of insidious corporations and the depletion of our world’s resources, I needed a palate cleanser. So I wandered over to the Playtest Area where small developers can showcase early designs of their games to players and get feedback. And once again, I ran into Breck, Leila and Kerr whom I’d met last year when they showcased a game they’d designed at the Moray Game Jam: Super Mutant Spiders. Given they’d come second in last year’s Game Jam with Super Mutant Spiders and I’d loved the design (ed. 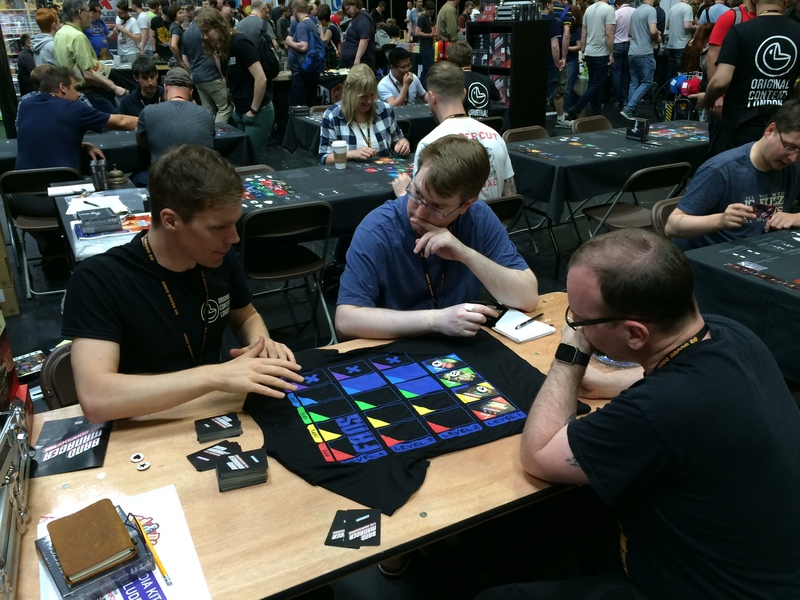 Check out UKGE2017 day 2 run down for more info True Believers! ), I asked Breck if there have been any moves toward getting it published. Unfortunately, all three had been busy with travel and work over the past year and didn’t have the opportunity. They did, however, enter the 2018 Game Jame and won first place. The Game Jam judges provide a theme that the competitors must model their game around and this year, it was: A World Without… And so Breck, Leila and Kerr decided to make their game about ‘A World Without… Everything’. Players choose one from many alien races that are looking to colonise new worlds. The players must then gather elements to terraform their chosen planet to match their race’s land and atmospheric requirements. Go to the Lab (to combine their gathered elements into an atmosphere or planet part). While the core actions are straightforward, there are great little wrinkles in the design that add tactical depth. While you draw blindly from the Nebula and the Asteroid bags, the players get to know the starting distribution of the elements in each bag. So if you count elements each player draws from each bag, you can keep track of the odds of drawing elements from each bag. Additionally, while a new technology enters play each turn, and forms part of a communal pool, their use is exclusive. So you can block players from using a given tech each turn by using it. In keeping with the fact that the Game Jam is done over 48 hours, A World Without was built entirely from scratch. While all three worked on the design, Breck handled the art (the bout of the Cold he was suffering at the time inspired one of the mucus, gooey aliens), Leila balanced the mechanics of the game (I’m assured Spreadsheets were involved) and Kerr constructed it (brilliantly put together). Just as Super Mutant Spiders leveraged simplicity of design and a hand crafted feel, so too does A World Without. And I’d love to sit down and play a full game of it. I’ll have to see about making the trip up to the 2019 Moray Game Jam to see the guys from Ellerium games create their next winning game. It was nearing the end of the day and I made my way over to Gil Hova at the Formal Ferret Games booth. 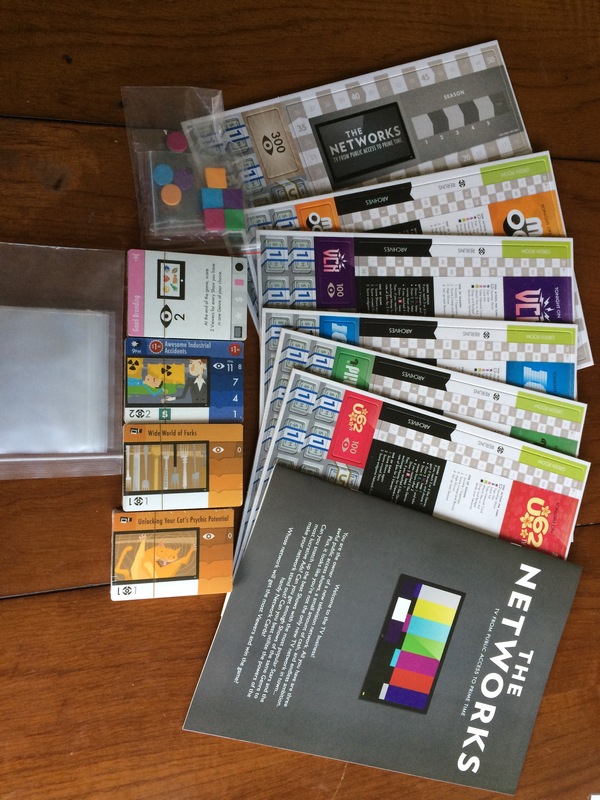 I’d passed by the booth a lot over the course of the weekend and wanted to find out more about ‘The Networks’, Gil’s latest game. What I learned was actually far more valuable. Gil had been on his feet talking to fans, passersby and publishers all weekend – and he was still smiling. He’d managed to get a couple of local friends of his to man the booth along with him so he wasn’t managing everything himself. And while he sat down and began to talk to me about The Networks, we veered off in a really interesting direction. Gil had released his first game, Protex, in 2010. Described as ‘a collection of interesting mechanisms,’ it struggled to find commercial success. Gil described spending a lot of time thinking about the broad concepts of games. How incentives and disincentives arise from mechanics. How players identify and are influenced by these two drivers. And how mechanics can incentivise interesting behaviour. He also spend a lot of time breaking existing popular games down into their fundamental elements and thinking about them. He describes Agricola as being about managing scarce resources, while Stone Age is about managing abundance. Ultimately, he came to realise that while mechanics and systems were important to a game, they should serve the overall theme and player experience. You don’t remember a game of Resistance because the ratio of spies to resistance members is designed to make things as tense as possible, all the way up to the final round. You remember the time when Derek was clearly the spy and Ben lied to me and goddamnit I knew David was the spy and Ben you stabbed me in the back again and don’t think I’ve forgotten dude. When you think about your favourite games, you think about the times you clutched victory from the jaws of defeat (and vice versa). Or when someone betrayed the team at a crucial moment. Or when you introduced a game to a friend and it quickly became one of their favourites. You remember the experiences you had playing games more than anything else. And those are driven by player behaviour and interactions. Gil recognised that the mechanics should facilitate those behaviours and interactions. Not dominate them. So he went back to the drawing board and re-released Protex as Wordsy, and has been following this design philosophy since. My core discipline is Economics and I thoroughly enjoy looking at how systems work. Identifying incentives and disincentives and behaviour that arises from them. But hearing Gil talk about what goes into the design of the game and the thought behind them – that theme and experience comes first in the design process and mechanics follow to support them – was incredibly interesting. Take a look at the Formal Ferret site and some of the games Gil has been involved in. He’s a modern Scarlet Pimpernel, popping up in the credits of games you wouldn’t expect. I’ll be picking up some bits and pieces because his design philosophy and outlook deserves to be supported and I want to see what he’s produced. 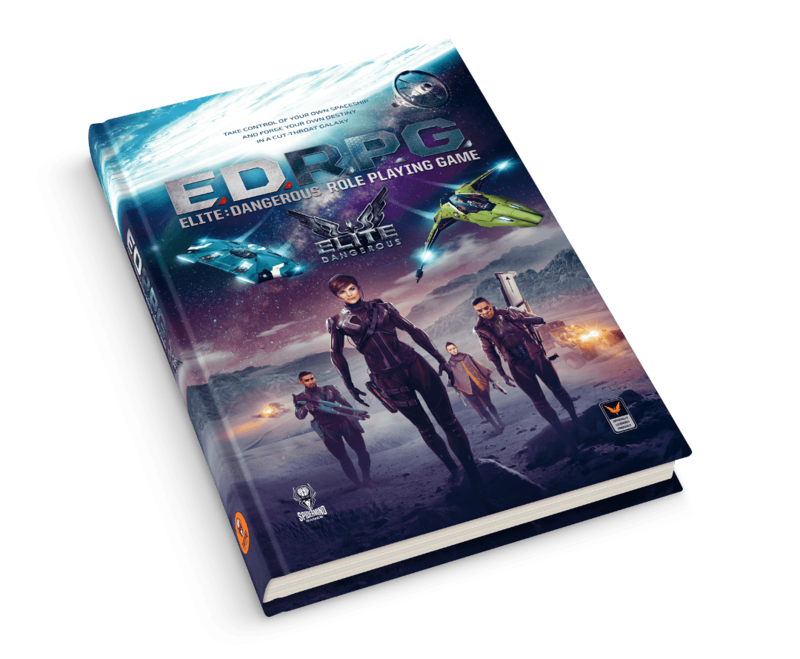 We re-grouped as we were due to play a game of Elite: Dangerous the RPG run by SpiderMinds ambassador, Steven Swaby. Ben has posted his thoughts on EDRPG on the site, but I thought I’d add my two cents. I’ve been able to hammer out my thoughts since we recorded the podcast and nail down some of the issues I have with the system. And there’s another reason I think about 3.5 when I see a core rulebook that size: rule complexity. Those books aren’t small for a reason – there’s a lot of crunch they cram in there. And I wholly subscribe to the notion that simpler is better: “Perfection is achieved not when there is nothing more to add, but when there is nothing left to take away”. Provide the GM with straightforward tools that they need to run a game. Don’t bog players down with flowcharts for dealing with combat. Make your core mechanic as universally applicable as possible and minimise your use of modifiers. 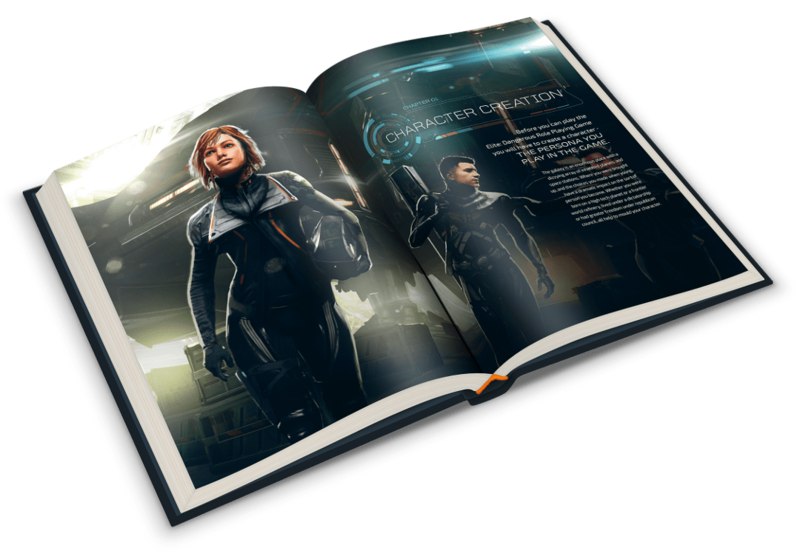 So when I look at the 370 page Elite Dangerous Core Rulebook – as beautifully put together as it is – I’m not filled with confidence. In a system where you use a single die for task resolution, you are just as likely to roll a 1 as you are a 10. An averagely difficult task – one that someone trained in the field should be able to do on a regular basis – has a target number of 10. Let’s assume a first level player has put the maximum number of points into this skill at character generation and adds four to any skill check they make. They need to roll a six on the die to succeed on an average check – five numbers on that die are no use to you. To put it another way: a character heavily ‘specced’ in the direction of passing one skill passes an average difficulty check on a coin flip. Bear in mind there are 36 other skills that you have neglected basic proficiency in to focus on this skill. The above may well sound like hyperbole, but imagine having to do one of those things in the above list every time you roll. Just to edge things slightly in your favour for an average check. The worst part is that this is a solved problem. Using two die for task resolution gives you a neat, clean bell curve distribution of possible results. This means that characters who have spent years developing and training a skill are able to complete average tasks without too much of a sweat. By adding a second d10 and bumping the difficulty number of an average task to 12 – a character with two ranks in a skill needs to roll a minimum of 10 to pass which gives them a 64% chance to pass an average check. A character with 3 ranks passes 72% of the time. And that’s before you halt proceedings to go fishing for circumstantial bonuses and perform oodles of mental arithmetic. This isn’t a problem specific to EDRPG – god knows I’ve had this issue with d20 systems for a long time. But, as I’ve said, this problem is solved and Elite: Dangersou is about being a cool, capable pilot who does rad stuff in space. Not some bumbling oaf who fluffs their actions more often than not. The system also uses ‘Karma points’ in a similar way to the Doctor Who or the Game of Thrones roleplaying games. You can spend Karma to activate abilities or cheat death. Which is all well and good, but DW and GoT have built-in mechanics for replenishing players points in a way that encourages players to do cool things or add twists or difficulties to the plot. The only ways you restore Karma in EDRPG is to sleep. And you only restore one a night or all of them ‘when you start a new adventure’ (read: if the GM remembers to give them back to you). And when you have a max of 10 Karma at level 1 and your sweet John-Woo-spin-round-and-shoot-both-guns-akimbo ability costs 8, you don’t really want to use it. Partially because you don’t know if enough of your Karma will replenish before the next time you need it. But also because it can be expended to re-roll die results of 1. Admittedly other Karma abilities cost less, spend 3 Karma to gain a +2 bonus on a Dogfighting roll for example. But I’m not certain the benefits are worth the cost you incur or the length of time it takes to recover points. Starship and Vehicle combat are abstracted out in a very neat way. You are either considered to be ‘At a Distance’ or ‘Up Close’ to enemies. And if you have ever attempted to run a combat with vehicles in a 3D space then you know what a pain managing it using a grid can be. It gets to the point where you’re using Pythagorean theorem to establish your distance from enemies or plot your movement horizontally and vertically. By having two states, At Distance or Up Close, you obviate the need for that nonsense. You have different actions for the two states, for instance: If you ‘Joust’ At Distance, you fire all your weapons at a single target and move into Up Close. ‘Dogfighting’ Up Close means you make an opposed Dogfighting check against a selected enemy and if you win, you also fire all your weapons at your enemy. I’d tell you about the other actions in space combat, but I’ve found the above two to be the most effective. The other actions don’t seem to offer any tactical advantages over firing everything you have at the enemy and potentially destroying them in a single volley. In fact, some seem to provide tactical disadvantages: ‘Snipe’ At Distance only allows you one attack, you stay At Distance, but your defence drops to zero. So if an enemy chooses to Joust you, you’re likely to be hit by everything they throw at you. Combat develops into a damage race – which ever side can throw out more damage than the other can take, wins. Combatants who are Up Close are up close with anyone in that state. So even if you’ve been Dogfighting with someone else in the previous round, there’s no penalty to Dogfighting different Up Close targets. This means that Up Close quickly becomes a scrum. You don’t feel like you’re personally engaged with a specific enemy who you can’t shake or who is bobbing or weaving out of the way of your fire. And group tactics quickly devolve into death by detail: taking out one target at a time is the sure way to win every single time. A small thing about the Space Combat rules: not all of the stats you need for Space Combat are on your Spaceship stat page. You’re constantly flipping between character sheets. Referencing things like your Piloting skill on your player sheet, then going back to find your attack stats. Just a small thing, but it caused no small degree of consternation and confusion during our game. Finally, I don’t know a great deal about the Elite: Dangerous setting. That might be on me. I’ve only spent some time playing the game and I treated more as a Space Truck Simulator 2, than an interesting Sci-Fi universe. That being said, information regarding the setting isn’t exactly presented to you front and centre. I’ve got a soft spot for Sci-Fi, the setting has a lot of potential to tell interesting stories and explore different aspects of humanity. So the opportunity to sit down with Steven Swaby and get a guide through the setting (in a similar fashion to how Richard Talbot introduced Traveller) was very welcome. Unfortunately when we asked at the game we were told we didn’t need to worry about it. The games I have played so far have involved me being a cop and an operative for a shadowy figure. The universe (the people and their relationships, the technology, the locations, the factions, etc) and our place in it is nebulous and ill-defined. While the core rulebook touts that you can be anything you like and play whatever game you want. The thing is, there doesn’t seem to be any support or guidance to do this. It may be that there are some splatbooks in production which detail different factions or parts of space, mega-corporations, religions groups, civil movements, history, technology, conflicts, and so-on and so-on. But right now there’s a dearth of that. The universe feels formless and you don’t have a place in the soup that makes it up. As a fan of the Sci-Fi genre, I’m pretty disappointed with EDRPG and I’m not sure the game we played did it any favours. I don’t think I could recommend it. Even if they released some additional content, I have fundamental issues with the game and the system which cripple the experience. We did however also pick up a copy of Coriolis, from Free League publishing. So we’ll see how we get on with that. 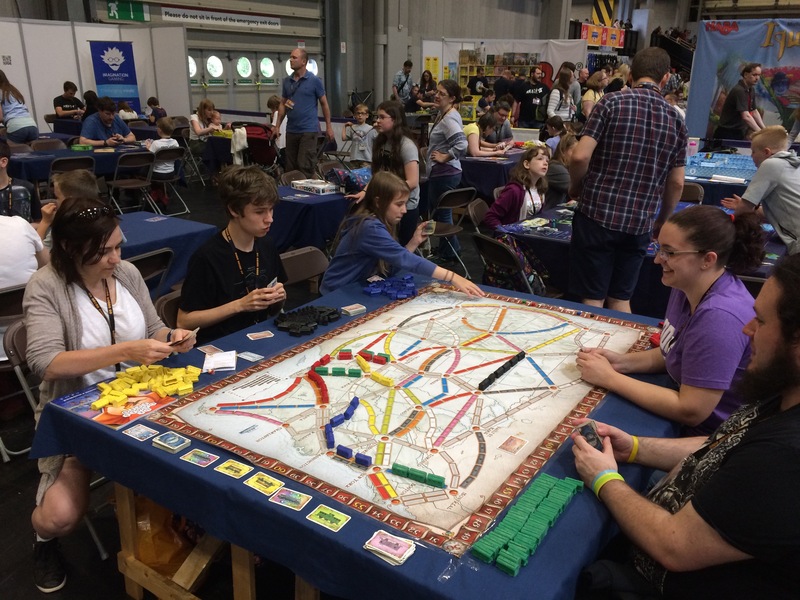 We’ll be back… UK Games Expo 2019! We finished up Saturday about midnight and agreed we’d take the final day a bit easier. I wound up picking up a few games that I had my eye on over the course of the weekend including Concept, Absolute Dice and some of the Taiwan Boardgame Design games. UK Games Expo 2018 was a cracking event, if you haven’t so far, try to get along for next year. They used more space and they needed it. While it was relatively quiet on Friday (in that you could move through the event easily), Saturday and Sunday were absolutely packed. I’d be really interested to see their attendance figures and compare with the last few years. Before we left Birmingham, Ben, Mike and I sat by the lake and the NEC and talked about what was next for the UK Games Expo. Mike, having been to Essen, compared the events and talked about how Essen is a trade show. Business is done there, meetings are had, agreements are made. UKGE is still very much a consumer show but he reckons that, as it continues to grow in size, its likely that will change. Developers meet at the bar, shake hands, trade cards and stories and catch up – is that going to become more formal? We’re not sure, but we will be there to find out. 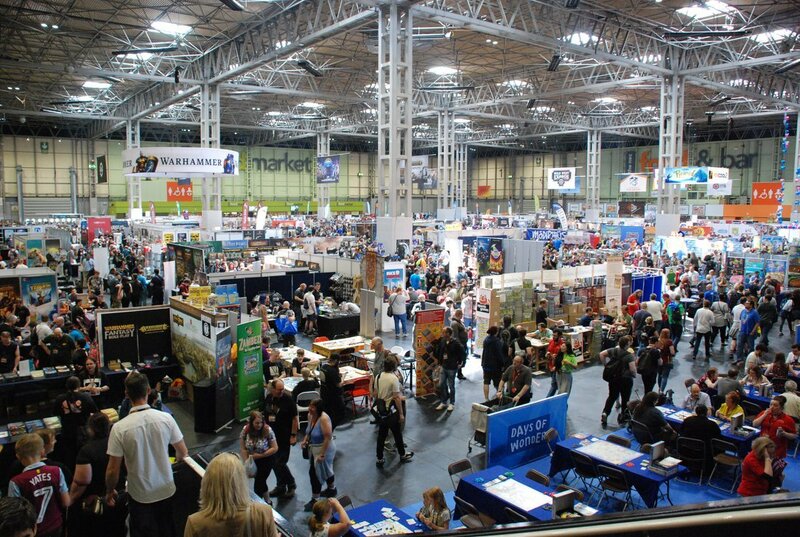 Ben, Mike and I will make the trip south for UK Games Expo 2019 to provide more coverage, news and reviews of the event. And we may even have a new challenger.